Used for object-oriented technologies and Test Driven Development. Assertions for testing expected results. Test sharing common test data. Able to manage multiple testcase as suite. Provides Graphical and textual testing runner container. Annotation to identify the test methods(After JUnit 4 ). JUnit version 3.8 and earlier supports Java up to version 1.4. Specialize to performing unit tests on code. JUnit is implementing in Test Driven strategy. Assert that methods in your Java code and test that it works as designed. The JUnit distribution is downloaded as a single JAR file, which can be placed in any folder. To actually start using JUnit, the JAR must only be put in the classpath of the application to test. This will execute the class my.test.TestCase as a JUnit test. The JUnit Ant task does support both JUnit 3.x and JUnit 4.x versions. By changing the version above in pom.xml, you can easily switch to different JUnit versions. Maven supports both JUnit 3.x and 4.x. JUnit version 3.x is the tool of choice if you need to test your application in a Java 1.4 environment or earlier context. 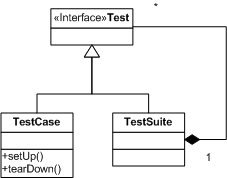 To understand the basic mechanism of JUnit, take a look at Figure 1. In (1) you create a class which extends the base TestCase class. Then, in (2), a generic setUp method is called. This one is provided by TestCase and is invoked per test method to be executed. The method is meant to initialize everything which is needed for the test methods invoked later. This may be instance variables, authentication and such things. The same applies for the method tearDown, which is not shown here. This method is called after a test method was executed to clean up the test environment, such as removing data from a database. In line (3) a test method is declared. Each test which should be executed automatically must begin with "test". Line (4) then executes a method under test. The lines (5) and (6) then assert expected values. That is, if the value 0 does not equal result, the test is broken and JUnit will stop proceeding. Line (6) adds readability by providing a message which is shown if the assertion breaks. By using such an approach, you can not only test the "good cases" of an application, but also the "bad cases" and invariants, as well. This way, the contract of a class can be asserted fairly easily, that is the complete behavior of what to expect from its behavior. If you have many tests for various classes, testing everything and executing all tests can be cumbersome. Therefore, JUnit offers a principle to logically group tests and thus simplify its execution. To logically groupTestCases together, you create a TestSuite. And since a TestSuite also implements the Test interface, various suites can also be grouped together. Using this strategy, a logical hierarchy of tests can be created. If you want to provide additional functionality, you can easily extend the framework by extending the TestCaseclass. Using this method, you can add additional methods for asserting things or simplify 3rd party framework integration.